The American West is bestselling author Larry Watson's forte, and in this, his tenth novel, he has created his most vivid, genuine antihero yet in Calvin Sidey, a man stuck in a myth. Calvin Sidey, steely, hardened, with his own personal code, is one of the last cowboys. It's the 1960s, and he's living off the grid in a trailer on the prairie when his adult son, Bill, seeks his help. A mostly absentee father and grandfather, Calvin nevertheless agrees to stay with his grandchildren for a week. He decamps for his son's house in the small town where he once was a mythic figure, and soon enough problems arise: a boy's attentions to seventeen-year-old Ann are increasingly aggressive, and a group of reckless kids portend danger for eleven-year-old Will. Calvin only knows one way to solve a problem: the Old West way, in which ultimatums are issued and your gun is always loaded. In the changing culture of the 1960s, Calvin isn't just a relic; he's a wild card. At the same time, his old-school ways exert a powerful effect on those around him, from the widowed neighbor, Beverly Lodge, who feels herself falling for him and wants to be part of his life, to his grandchildren. Ann and Will see in their grandfather a man who brings a sudden, if shocking, order to their lives, as Calvin terrorizes those who have often terrorized them. 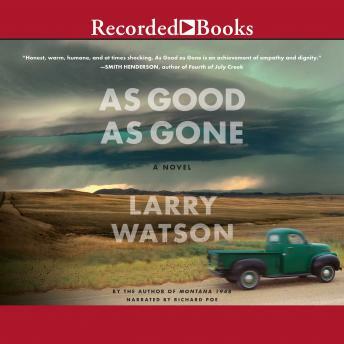 With the crisp, restrained prose for which Larry Watson is revered, As Good as Gone is a story of a man increasingly at odds with the world. This is Larry Watson at his best.